Next year WWE's annual extravaganza, WrestleMania, will be held in Miami, FL for the first time ever and I'm particularly excited because I live in Miami! That's right, WM28 will be held in my hometown and feature a hometown hero in the main event, Dwayne "The Rock" Johnson! I'll most likely enjoy the show from the comfort of my own home like I have the past couple of years, but it's still exciting. 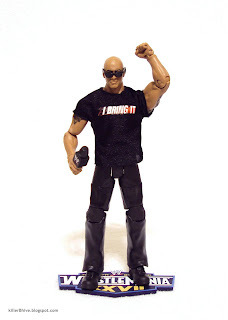 In anticipation of 2012's WrestleMania main event, Mattel created this special edition exclusive The Rock action figure for Toys R Us. Along with this new Rock figure comes a new price tag (argh! ), let's see if he's worth the TRU mark-up. This version of The Rock comes in modified Elite Collection packaging very similar to Toys R Us' exclusive WrestleMania XXVII series. Technically this Rock is part of that series, but his box is labeled "Road to WrestleMania" instead of the WM27 title proper. The back of the package doesn't feature any specific biographical information on The Rock, but rather on the WM27 event itself. It also features images of the rest of the Superstars in the series. The Rock is a mix of old and new parts. First, his head has a brand new sculpt with Rocky's modern bald look. There's a great snarling expression on his face very similar to his previous WWE Legends figure. The upper torso is identical to that figure's. The change comes in the form of his lower body, but before you go off thinking it's brand new, we just saw this lower body on Vince McMahon's first Mattel figure. That actually caught me by surprise. I guess I hadn't noticed it in the pictures from SDCC or until I had McMahon in hand. I automatically assumed his lower body featured sculpted pants similar to his Royal Rumble 1999 track suit pants. I think the confusion came from how he appeared at WM27 rather than his return to the WWE this past February. In that respect the figure is accurate (mostly) to his appearance where he was indeed wearing dress slacks. While this Rock ends up being taller, the lower body works a lot better for him than it did for McMahon. WM27 Rock is only slightly taller than his previous Legends release. I still say the new "business suit" body will work fine as long as they resculpt the lower legs for various Superstars. The Rock did receive new feet, though, more boot-like than the shoes Vince is wearing. 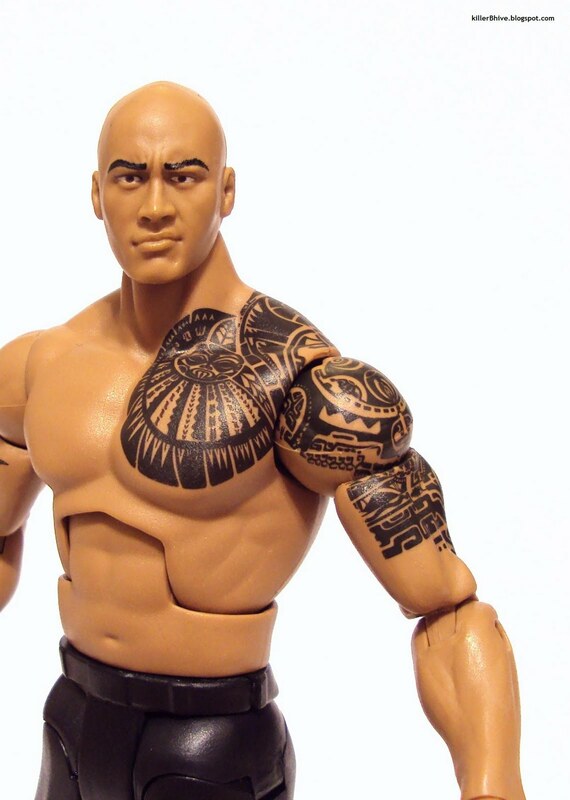 The most significant update to Rock action figures this version introduces is his traditional Samoan tribal tattoo, which climbs up from his left elbow to his collar bone, spreading over his chest and shoulder blade. I'm sure many fans were eager to see how this intricate design would translate into figure form. Mattel's done some really great stuff with the figure tattoos, but this one is truly a masterpiece. They may not be responsible for the actual designs, but they were able to incorporate them on to the figure nicely and neatly. WM27 Rock also features his trademark bull head tattoo on his right biceps. The paint applications on his head and the tattoo tampos sum up all the paint work on the Rock because everything else is molded in the required color. The Rock includes three accessories: sunglasses, "I Bring It" t-shirt and microphone. I can't say I compared the sunglasses to all the other sunglasses we've seen in the Elite & Legends lines, but I think these are again newly sculpted. They do look very similar to his Legends sunglasses, though, except they're molded in black. The t-shirt features more of a silky texture than his Legends figure's "Layeth" t-shirt, which was more cottony. The "IBI" phrase is screen-printed sharply and looks good with it's red streak behind the text. Now for this figure to be 100% accurate to his return appearance, the t-shirt should have had the sleeves cut-off, but I assume that would be detrimental to the piece. The microphone is just the same old one we've seen before, WWE logo only on two opposing sides instead of being printed on all four sides. Would it really hurt Mattel to print the logo on each side? Finally, there is a fourth "hidden" accessory in the package. It's a WrestleMania XXVII display stand! Remember when all Elite figures came with display stands? I think this one is much more effective because it's show-specific. It's a really nice display stand and the reason, I assume for the price increase. "Road to WrestleMania" Rock is a Toys R Us exclusive, so try searching for him there before resorting to eBay or other online retailers that will surely mark-up the price even further. Selling for $17.99 at retail, he cost me $19.25 with tax and that's really stretching the limits of my action figure budget. You can rest assured that we will see an Elite-styled, modern Rock in ring attire in the very near future, so you may want to consider that before pulling the trigger on this figure. This version delivers The Rock as he appeared to us last February and would easily qualify as a "Defining Moments" figure if not for the lack of memorable attire. Plus, you may be interested to know that you can get one of these for free at TRU when you buy $30 worth of WWE items starting this Sunday, October 30th through November 23rd. That's not a bad deal since buying two Elite figures will easily be more than thirty bucks. Also, the Elimination Chamber play set is coming out soon, so that alone would qualify you for a free Rock.